Crafting your own hardline water-cooling loops is hard enough in a normal PC. But that challenge wasn’t enough for son Jason and father Graham from YouTube channel Geek Seek. 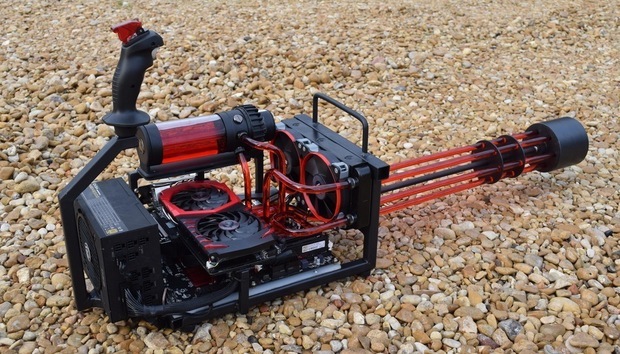 So the duo created a fully custom open air “Minigun gaming PC” inspired by the M134 minigun, incorporating the aforementioned liquid-cooling throughout the “gun’s” barrel. This custom PC mod is amazing… and it’s just begging for an extensive Doom play session. Jason and Graham relied on AMD hardware in order to fit the Minigun PC’s black and red color scheme. Inside, you’ll find an AMD FX-8320 processor, an ASRock 970A-G/3.1 motherboard, 16GB of G.Skill Sniper memory, and the MSI RX 480 Gaming X graphics card that recently impressed us in a similarly all-AMD rig built for Battlefield 1. But those are the easy parts—the hardware you can snag on Amazon or Newegg and slap into any old PC. What makes Geek Seek’s minigun PC, well, a minigun, is the DIY touches, from the rigid liquid-cooling tubing with a D5 pump/reservoir combo to the custom-welded steel frame with acrylic accents. The duo modified the system’s power supply and created custom mounts for the graphics card to make it all fit. They even added a flightstick to the top of the PC to act as the minigun’s handle, modifying a trigger to act as the rig’s power button. “We added a flip cover to stop friends from accidentally powering us off during the middle of a game with a, ‘Hey, what’s this button do?,'” Jason says in the video chronicling the system’s birth, which you can see in full below. It’s definitely worth a watch for PC enthusiasts, as Jason and Graham dive into the intricacies of the Minigun PC’s liquid-cooling design, explain exactly how they created the custom chassis, and talk about the importance of cable management. It’s the kind of tangibly helpful information that could lead you down the path to creating a monstrous custom mod of your own one day. In the meantime, be sure to check out Geek Seek's other videos, where the duo walk you through the creation of DIY laser harps, flaming swords, and more. It's seriously impressive stuff.